Tue., Dec. 29, 2015, 6:01 a.m.
RIVERS -- Avista Utilities will start the annual drawdown at Lake Spokane (Long Lake Reservoir) on Thursday, Dec. 31. 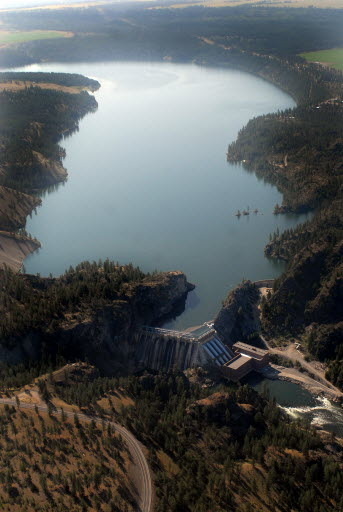 Operators expect to lower the reservoir's water level up to a day over a two-to-three week period, until it reaches its winter elevation of 13 to 14 feet below the normal summer elevation of 1,536 feet. Under the right weather conditions, which include sustained periods of single-digit temperatures and little or no snow on the exposed lakebed, the drawdown is expected to help control Eurasian watermilfoil and other invasive aquatic weeds found in Lake Spokane. The drawdown also allows shoreline homeowners the opportunity to complete state and locally permitted repair and construction projects along the lake shoreline. Property owners and lake-users are reminded to make necessary preparations, including removing boats from the water, and removing or securing docks and boathouses to accommodate shifting ice and low-water conditions. Floating and removable docks are less susceptible to damage from shifting or changing ice levels. The lower winter elevation will be maintained as long as river flows allow. However, during the drawdown period water levels are subject to change due to a variety of factors, such as weather (rain on snow events in the upper drainages) or maintenance at the Long Lake Dam. Lake users should always be alert to signs of such changes and exercise the highest level of personal caution and safety. See waterflow information online or at avistautilities.com/waterflow or call for recorded info about the Spokane river, Lake Spokane and Lake Coeur d'Alene at (509) 495-8043 or in Idaho call (208) 769-1357.